now that I am also over 100 hours into A2A's C182, I thought I look for an alternative for X-Plane. Actually, the thing that most interests me is a way to keep the status of the airplane's equipment "static" from flight to flight with ageing while simulator is off. And shockingly, there is something for X-Plane that resembles A2A . It is called Real Expansion Pack for Cessna Centurion. You have a hangar, can change and repair parts, plane state is loaded from the last flight's state, engine temperature is consistent with how long the plane stayed on the ground between the flights, etc. You even get the oxygen system simulated for high cruise flights. To be able to use this, you do have to own the CT210M Centurion II HD Series from Carenado prior and then get the Reality Expansion from Simcoders. What you don't get is the wear and tear of a plane sitting on the ground for long periods (the engine just cools down) of time as with the A2A's. Also, there is no walk around with worn hinges on ailerons and no impurities in the fuel. But the very good thing is that you do get an engine simulation in X-Plane. Having said this, there are other X-Plane add-ons that employ a form of persistent state but not to the detail of Simcoders': all Flight Factor add-ons keep track of the landing rates and taxes you on hard landing the next flight. And here it is. The real thing. Airfoillabs have stepped on to the plate and have come up with the Cessna 172SP Immersive Experience - http://store.x-plane.org/Cessna-172SP-Skyhawk_p_401.html. 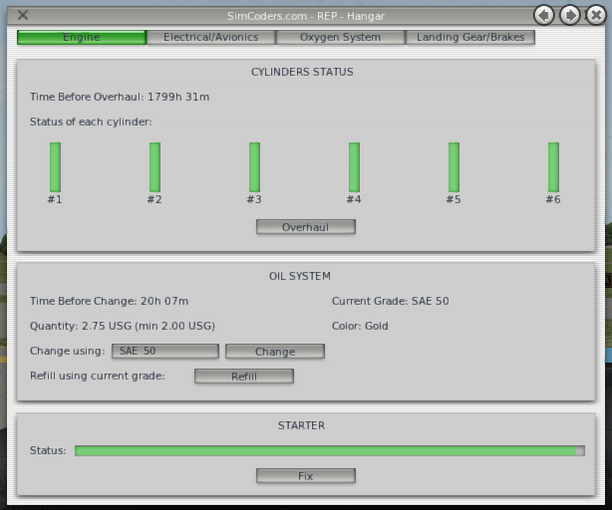 Besides accurate flight modelling "to the letter" (pilots and instructors), the add-on introduces the walkthrough, realistic loading (with lateral and longitudinal moving of cargo and people - seats can be moved and it influences the CG), GPU, towing, oil check, engine cowling removal, realistic electrical model, realistic sounds and headphone attenuation. From the pictures, I think my only problems are that the instruments are to complex for a 172 (for example the EGT and fuel flow gauges seem to much for the 172 - the 172 being more of a sound managed as opposed to gauge managed plane) and that there is no talk about recursive state (saving the state that you left the plane in and even ageing it down during idle time on the ground as A2A does).